Because it is the biggest and most prominent city along with being the namesake, Paso Robles can be thought of as the only town in northern San Luis Obispo County. However, the AVA (American Viticultural Area) which was just named the world’s Wine Region of the Year has several other towns that in their own right have as much to do with the areas notoriety as Paso Robles does. The Paso Robles wine region runs from Shandon in the east to Adelaida in the west and from San Miguel in the north to Santa Margarita in the south. These towns are all unincorporated, yet have a distinguished and long history with the ‘North County’, as it is sometimes called. We can’t list them all but here are a half-a-dozen towns in the Paso AVA, with a very short description of each (listed alphabetically). Adelaida is one of the oldest and smallest areas in the Paso AVA along with being the furthest west and highest in elevation. Adelaida – This is an old town that has a history going back almost as far as Paso Robles. It was created in part by mining and was a thriving community with everything a small town could ask for, but now is little more than some crumpled old buildings. Adelaida and vicinity has about 500 residents peppered through this hill country and sits between 1,500 and 2,000 feet elevation-wise up in Santa Lucia’s of the California Coastal Range roughly a half hour west of Paso. With milder weather than Paso, Pinot Noir – known to be a cooler weather varietal – is said to have first received its start in the Central Coast, among the hills just west of Adelaida. Creston – A very small town with little more than a 1,000 residents, it’s as well known for its ranches as any vineyards. Many horse ranches dot the area as well as cattle, plus also orchards are not uncommon to see in between the mix of horses, cattle and grapes. The Creston temperatures are ever so slightly warmer in Summer and cooler in winter than Paso Robles. Some 20 minutes or so minutes southeast of Paso, the soft rolling hills of Creston and surrounding area offer an idyllic setting that is pastoral and quiet. Rhone varietals (Syrah, Grenache, Viognier et al) are common in Creston. San Miguel – Likely the oldest settlement in North County and started up by the Franciscans (Mission San Miguel Arcangel), this town of less than 3,000 is just a couple miles from the Monterey County line and less than 10 miles north of Paso Robles. A relatively flat farming community with slight undulating hillsides, wineries can be seen in all direction around San Miguel. The temperatures are about the same as Creston with all assorted grapes common for the area. 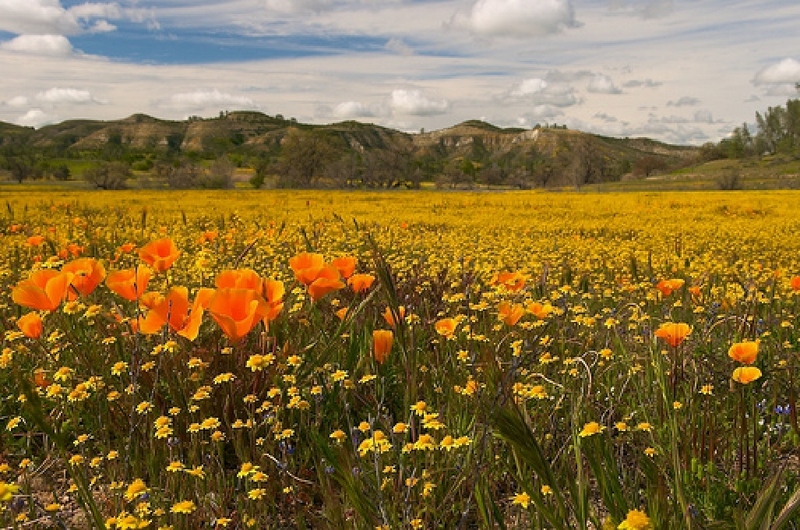 With moderate temps helping, Santa Margarita has an abundance of rangeland (such as this poppy field). Due to the mild climate, the area can grow almost anything year around. Santa Margarita – The quaint town of 1,500 is about as far from Paso Robles as you can get (22 miles south) and still be in the AVA. It is just over 1,000 feet in elevation and is at the edge of the Santa Margarita Valley which was a popular place for farming 200 years ago. Ranching is still common in this area but wine is obviously produced from this quiet corner of the world. Just north of the Cuesta Grade and San Luis Obispo, the temperatures are very mild in comparison with any of its brethren in the Paso AVA and that allows for a longer growing season. Cabernet Sauvignon, Sauvignon Blanc and Zinfandel are among the many wines grown in this very southern tip of the Paso Robles AVA. Shandon – Somewhat like Creston but with a drier climate and further east, this cowboy and ranchland also has its fair share of wineries. 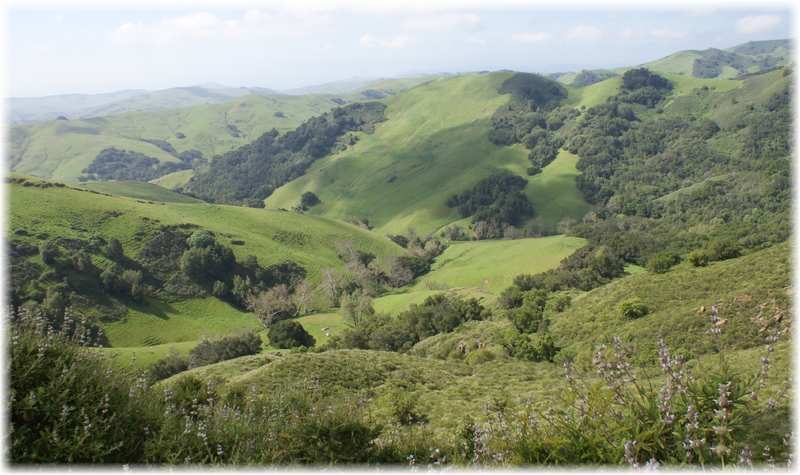 Called the San Juan Creek region at just over 1,000 feet in elevation, this town of maybe 1,500 sits on low lying hills and grasslands about 20 minutes east of Paso Robles. With likely the driest region of all the Paso AVA, they are still able to produce robust wines including Cabernet Sauvignon on the land south and west of Shandon. Templeton Gap allows cool air from the Pacific to reach inland and moderate temperatures for great grape-growing. Templeton – Probably the closest and most similar to Paso Robles, the charming town of Templeton is known for the Templeton Gap where the winds come through the Coastal Range and keep things a bit cooler than Paso. The town of Templeton has about 8,000 residents but that includes a sprawling area that reaches several miles east and west of the town which is less than 10 minutes south of Paso Robles. Somewhat quirky, it has a very small town atmosphere and is much like Paso was a half a century ago. Everything you can think of in wines is made in the Templeton area and in fact, many of the wineries with Paso Robles designations are actually in Templeton. These towns are rich in history so the next time you have a chance to visit the number one wine region in the world, definitely check out these unique and charming towns who help make up the viticultural area called the Paso Robles AVA. This entry was posted in Central Coast and tagged Adelaida, Creston, Paso Robles AVA, San Miguel, Santa Margarita, Shandon, Templeton on November 23, 2013 by PasoDr.